It effectively represents the first time that we’ve replaced an existing, lower quality facility. Despite the early morning there was a decent attendance to celebrate the opening with a mix of politicians, officials, advocates and even the odd passing cyclist stopping to watch. 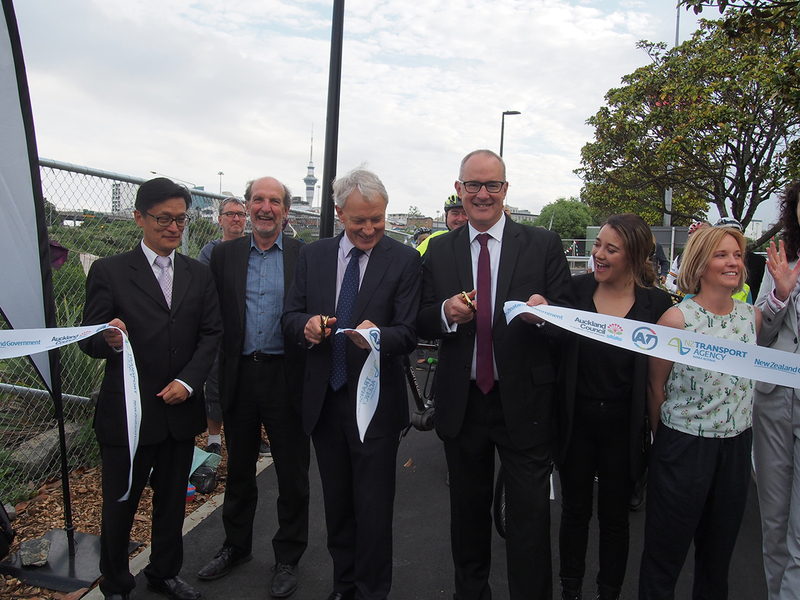 The cycleway was opened by Minister of Transport Phil Twyford and Mayor Phil Goff with my only regret being that I didn’t record the fantastic speeches each of them gave. Like we’ve heard in other events, Phil Twyford’s speech almost sounds like on of our blog posts. He spoke of the need to build more cycleways and to give people choice in how they get around, about how we need to encourage modeshift to enable the city to continue to function and even had a few subtle references to the news of AT removing dedicated walking and cycling teams. 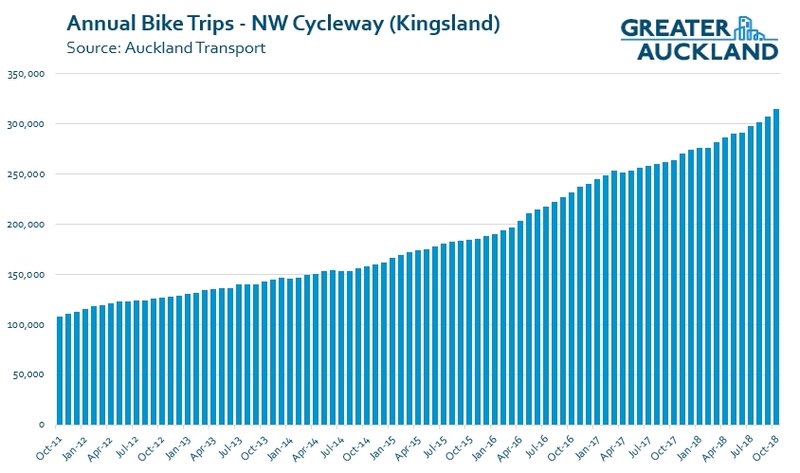 Phil Goff made many similar comments about the need to build safe cycling infrastructure and “Take that Mike Hosking” after mentioning the NW Cycleway has seen a 28% increase in usage over just the last year. AT put out this video about the project, I unexpectedly happened to be in the background of a few shots. As for the cycleway itself, it’s a beautiful piece of kit and reflects how we’re getting better at designing them. Most notably, the cycleway is 4m wide making it much more comfortable to ride along and is in stark contrast to some parts of the NW Cycleway, especially the section not far south of it. It is also very nice and smooth which is a big change from the old shared path on the other side of the road. In addition, by eliminating the hill and sticking to the northern side of Ian McKinnon Dr it saves having to cross the road, especially useful for those heading down Queen St or to Lightpath. Because of all of these factors, AT say the cycleway is estimated to save about 2.5 minutes per journey. What I also found noticeable was how pleasant the ride was through Suffolk Reserve and along Ian McKinnon Dr while you’re behind the trees. Here’s a quick video I made of the cycleway riding home on Friday afternoon. If there is one ‘complaint’ it’s that it was inevitable that the factors described above that make it an attractive cycleway, will also make it an attractive route for walking. There was no footpath added. I can appreciate it would have added a lot more cost but even in the video you can already see people using it as a walking connection. One thing I’m really looking forward to seeing is what impact this cycleway has on the number of users on the NW cycleway. Every time the cycleway has been extended, improved or new connections added, usage has grown. This can be seen in the numbers. In the 12 months to the end of Oct-2011, just over a year after the section from Myrtle St to Bond St opened, 108k trips were recorded at the Kingsland sensor. After the Grafton Gully cycleway opened in September 2014 the rate of growth increased and then accelerated even further just over a year later when Lightpath and Nelson St opened. Since then there has continued to be strong growth, helped by improvements along the causeway as the motorway upgrade completed, the connection of the Waterview shared path opened and better city cycleways, such as on Quay St improved the network. As such, as of Oct-18 over 314k trips were recorded, a 190% increase on that 2011 number. On a related topic, AT CEO Shane Ellison wrote this piece about why AT is “committed to walking and cycling“. One of the interesting comparisons he makes is to that of the rail network. It is easy to forget that in 2002 less than 2.5 million trips were made on Auckland’s rail network. In the year ended 30 June 2018 over 20 million trips were made. Is it so hard to envisage that the phenomenal success stories of our rapid transport network will not be repeated on our cycling networks? Even though it is early days we are seeing some remarkable similarities with, for example, ebikes doing for cycling what electric trains did for our rail network. Finally, another connection that will help grow the NW cycleway, while being great in it’s own right, is getting closer. Earlier last week, AT announced they were looking for tenders for the Karangahape Rd upgrade. That project will see K Rd upgraded, including having protected cycleways. Have you ridden the new cycleway yet? If so, what are your thoughts? Is there a counter at this new cycleway? Couldn’t see one form the video. Would be good to track its usage overtime. No they don’t need one. They will just ask their consultant to make a number up. Perhaps they could build a model to make the number up for them? Really unhelpful. You happy to have kids without safe cycling because you’re making comments that prolong the bikelash? Cindy, you should be demanding a change so that people in cars must wear helmets as it would do more good for them than helmets do for cyclists. Surely you are aware of the scientific research establishing that cyclists wearing helmets imbue a false sense of safety, both to the cyclist as well as the other road users – where they all take extra risks that they wouldn’t have had the cyclist not been wearing helmets. If cycling without helmets is unsafe, why is it not mandatory in all the major cycling countries? Mike G and Matt I can tell you both that if you fall off your bike and your head hits the road at speed, you will not regret wearing a helmet. This has happened to both of my kids, who were both hospitalised but extremely thankful that they were wearing helmets. The helmet took the damage both times. As a result I am far from dismissive when folks point out the safety advantages of wearing helmets. Separated cycle lanes are also important safety improvements, as is frequent public transport, and we need much more of both and not just in central Auckland. Very happy to see this new one up and running! David B – the question isn’t around whether you should were one or not, it’s about whether it should be compulsory. I would continue to wear a helmet even if it was not required, but I don’t think it should be the law. Compulsion should only be used if there is harm to society, such as health costs, not just the individual. The evidence suggests this is not the case for bike helmets. Actually, Mike G, the best way of achieving safety in cars is not to get the drivers to wear helmets and have safety crash-cages. As you can see from Rally and Formula 1 racing, that just encourages excessive speeding. The BEST way of having people drive sensibly in a car would be to have a giant steel spike poised just a few millimetres away from the drivers brain, or eyeball. I think someone has done an experiment with this: the result is that people drive really, really carefully. Threat of impending doom usually brings out the most careful reactions in people. So – no helmets in cars please, no helmets in the home either (most injuries occur from people falling over in their own house), and no helmets on bikes. I think you are onto something Average Human. When I was a youngster the Army advertised by showing tanks driving everywhere and being literally bullet proof. The drivers of SUVs around Auckland seem to have taken this “ I can’t be harmed so I don’t have to consider driving carefully” to the limit. Let’s make cars out of egg cartons make everyone safer. LOL. My laugh for the day. And I believe that I am alive and well due to wearing a Cycle Helmet when I was doored by a parked motorist. That’s great, Dale, happy to hear it, but your survival misses the point. I’ve never heard anyone arguing against helmets per se (leaving aside the observation that Matt makes about a false sense of security, which is at least arguable). The point, of course, is helmet *laws*. What happens is, for whatever reason, rational or otherwise, when laws that make wearing a bike helmet mandatory are introduced, they lead to a drastic reduction in the number of people cycling. What that does is, in the long run, causes so many people to become less active over the years, that the number of increased deaths from inactivity increase: diabetes, heart disease, cancer far outweigh the reduction in head-injury-trauma related deaths that the helmet laws are intended to prevent. It also increases the risk to the remaining cyclists. So, for example, drivers don’t think to check their mirror when they open their door (or like the Dutch do, use their opposite arm to open the door, requiring them to turn their head round to see directly if there’s a bicycle coming) because they don’t you to be on your bike passing their car at exactly that moment. That’s why helmet laws are so bad. They put people off cycling. They’re anything but civil: they’re terrible, awful, and a mistake. Their tragic net effect on society is miserable ill health and early death. I believe the closest are at Bond St on the NW cycleway, and at top of Dominion Rd before the flyover. This should capture the majority of people feeding into Ian McKinnon. Shouldn’t there be a better connection inthat area underneath Newton Road back to Ian McKinnon Drive/Dominion Road? The service lane has been opened up to make this connection, see at 0:55 in the video. Looks great, and cutting out the steep climb will be nice for those of us sticking to our push bikes. The cycle count numbers are impressive, especially when those for the NW cycleway in the last year, for example, were already pretty strong. The case for separating the cycleway from the cars at intersections with St Lukes Rd, etc, is pretty damned strong. Shared paths place users with different needs and speeds together and if AT and NZTA continue to build them, they’d better take on the responsibility of explaining to the media, constantly, why they choose to do so. Particularly on a section like this that will see such high numbers. There is no good reason other than not wanting to reallocate more funding. But they could at least use statistics of relative risk. An especially great thing about this is the short on-road section. Made cheaply and quickly by simply taking a lane. We can add the missing bus and bike lane networks quickly and affordable by working largely within existing corridors, with minimal intervention. Convert a parking or general traffic lane, repurpose the space hogged by flush medians, calm traffic and increase safety. It will take too long and cost so much more if we only try to fix our dangerous and monotonal roads and streets while keeping all parking and the current inefficient and dangerous vehicle priority pattern. The opportunities for speeding up their operations are rather large. Another enhancement that’s coming along is the rebuilding of the link to Waterview Shared Path – turning off the NW at Gt Nth Rd. I’m hoping there will be an improvement in that rather scary place where you craned your neck to see cars entering the BP station. (Tho not as scary as the supposed pedestrian crossing across the first part of Maioro Rd from the shared path towards the SW… off topic here). That project is late, it was supposed to be finished by 20 November. From what I can see they’re only repairing the bridge damage from the storm 3 winters ago. It will remain narrow with its blind corners and wiggles. I had hoped the bridge would have been widened and the alignment fixed on the south side. And I agree the entrance and exit of the BP are danger points. I’ve complained to the council a number of times with multiple near misses at both. Nothing has been done. At the entrance the biggest risk is when cycling northbound and a northbound car turns in at speed from behind you. You’d need to look behind you to see it coming, at the point where you also need to be looking at the kerb, rough surface and piles of gravel, glass and rubbish that always litter the crossing. At the exit the risk is also northbound, as there is poor visibility to see cars through the bushes, and the car drivers are looking right. Exactly! Wouldn’t it be nice if you didn’t have to take your life in your hands when you were out cycling! Another benefit of this route is that it has unlocked Suffolk Reserve by creating much easier access and passive surveillance from passersby. A nice spot for a pause before the big climb into the city. Absolutely. If you don’t use a car to get your kids to after-school activities, and cycle instead, you need these little parks as stops. Really love that this has come to be however I do wish there was better provision for cyclists coming down from Dominion Rd. You can pick up some good momentum to assist with the uphill but if you want to use the new path you have to slow right down and start from scratch. Yes, an oversight that they did not allow for zooming road-riders to merge onto the cycleway at the point where it comes onto the road. They could simply open a larger gap between the first concrete separators. Sledgehammers do have a noble history in tactical urbanism. See the Rolling Quads in the USA who advocated for wheelchair mobility, taking sledgehammers to curbs and resulting in updated street design codes to make “curb cuts” the status quo. And of course there’s the whole Depave movement. Dominion Road cyclists are probably going to just try and use the gutter at the beginning of the road section to miss out the off road section when coming up the hill. Going down the hill, honestly, to get to dominion road, the old cracked one is probably a better option. Awesome infrastructure if your carrying along the NW, not so much if you’re going to Dominion Road. It’s not really high speed, coming from Dom Rd towards the City on the road, by the time you get to the point the cycleway comes out onto the roadway you have already lost most of your momentum, and you have a very clear view of cyclists coming downhill toward you so you know if you need to stop. If you’re concerned about the high speed of the downhill cyclists heading away from the city, how is this any different at the intersection they have built under newton rd? AT assured me they were going to allow for dominion rd cyclists to carry on and merge into the cycle lane where it joins the road. They were not going to force confident riders to stop and merge at the bottom of the hill. It seems they forgot to do this. In the meantime i am using the narrow gutter gap to merge in, less than ideal. Regarding this being the replacement of existing, low quality facility do you have any general thoughts on upgrading other facilities. I have often wondered if by retro fitting protection on areas like St Lukes, Te Atatu Road, Don Buck and Triangle etc we might get more local people on bikes for a relative low cost, quick treatment. i’m sure many people still think only the “brave or foolish” would ride on some sections. I should add i’m thinking from a cost efficency angle- would putting some protection on existing lanes create an increase in numbers riding bikes in a cheaper, quicker way than brand new facilities. And if so should we consider it? The problem with St Lukes Rd is that it just stops, meaning I can’t consider it for many trips I want to do. One improvement along there, though, desperately needed, is a bus stop. Nothing between GNR and NNR! To achieve this, a better design for the cycleway will be needed anyway. If they’ve done a poor bike-bus bypass, I’m not surprised. I looked at it and wondered what on earth they’d do. Definitely a piece of cycling infrastructure that needs upgrading but I think they need to put a cycle lane all the way along St Lukes, Balmoral and Greenlane first. How did that road miss out on getting an integrated corridor focus? Yes think this is the one I used on the morning of the cycleway opening (trained in from southern line) literally had to as a 650 bus pulled up when I got to it… cosmic really. Only minor fault I saw was the curb height to the green cycleway bypass on left of the bus stop was a bit high. I have big wheels and front suspension forks so I suspect s bit harsh for something less than this. Funnily enough didn’t expect such good infrastructure and was contemplating a risky manoeuvre or waiting behind the bus when suddenly presented with the situation. I hate hate hate to be negative about this, but the connection from Dominion Road to the new cycleway is a massive disappointment. How do we get this to be part of Stiassny’s review of NZTA? If they change how they model, and how they use the models, the RCA’s will have to follow. Think you’ve made a typo when discussing the Kingsland bike numbers. By my reckoning they’ve grown by 290% since 2011, not 90%. +1 And probably worth fixing up in the article, Matt. Looks like the 314k is 290% times the 2009 figure, meaning an increase of 190%. Used this Friday going across town from the W towards the domain, great path. My problem is the lack of a pedestrian/bike crossing of Upper Queen St to head up Alex Evans St to the Symonds St bikepath. The alternative is to head on up the steep pinch on Upper Queen St and turn right into K Rd. Not much fun!!!! Yes I think of course projects need their scope, so everything connecting to it will likely need to be improved. So, almost [exactly] 31 years since Ian Mckinnon drive was “opened” to cars. The NW cycleway that was hastily terminated at the top of the Newton Road overbridge has sat unfinished too. In 2018, AT, as the successor to the Auckland City Council goes back and finally retrofits it for a pair of protected cycle-lanes? Ignoring the pedestrians that might want to use to also use it as a shortcut “under the bridge”. And we’re supposed to feel ever so grateful for a half done job? Really, NZTA/ACC could have built that “link”, properly, under the Newton Road overbridge from day 1 if they chose. Shows how far we have come, but also shows how we haven’t really come at the same time. Ellison’s comments about how the ramp up in cycling number is going like the trains did are ok.
To a very. Limited. Point. He conveniently forgets that before we had electric trains, The Government spent a lot of money upgrading the network [double tracking out west, new 2-way signalling systems, upgraded stations and lot of other “infrastructural work”] on the network, that the electrification and the electric trains just dropped onto. If we had attempted to put the electric trains on the infrastructure we had back in the 2000’s, the Rapid Transit Network revolution would have stalled very quickly and we’ed still be struggling to cope way more than we are. So, yes Rail’s success is totally built on the shoulders of the many earlier and expensive projects. Yet, we don’t quite see the same rate of investment happening for cycling networks as we saw for the rail networks 10+ years ago now. And we don’t have 30, 20 or even 10 years to get this network built. We’re still begging AT to give us proper facilities. And even when they “obilige” we get a kick up the arse in the form of no pedestrian separation, nor a proper link with Dominion Road. Of course cyclists and pedestrians will use what you give them, anything is better than nothing. But we all need, and deserve, so much better, much much sooner than the current plans allow for. These projects are truly tiny, baby steps, and its simply part-fixing a dumb f*ck up from 30 years ago – so doesn’t count in my opinion towards any true measure of transformation of the cycle networks. Disbanding the walking and cycling team into the rest of AT doesn’t count either – even if they use the guise of “spreading the learning” to explain why its a good idea. Ellison has a vision, but its not one his organisation shares or champions. So basically you are saying it’s a 20 year too late half arsed job but better than nothing? Couldn’t resist walking from Dom Rd end to get the upper Queen St and witnessed a suicidal zoomer threading between obstacles to enter the Cycleway and had to dodge irate cyclists because I was walking the Cycleway with umbrella up. I didn’t notice any monitoring cameras but I can see a zoomer coming to grief sometime or peds getting crumpled or gouged. I go pass that everyday. They cycle-way are very nice and flat. However the traffic light around that intersections give very low priority for cyclists and pedestrians. In worst case it would add 2 minutes of wait. and proceeds to put access and safety as the top priorities now. Changing traffic signal priority is one of the cheapest things AT can do to align our network better with the GPS. The cycle way is good, however they should also consider to fix poor connections from it to other popular cycle destinations. It adds KM or two to my trip out west, but I rode down there on Friday afternoon. I was coming down from Symond’s Street and found it rather convoluted to get across the intersection at Upper Queen St. Ended up on the footpath, meaning I had to wait for two crossings to get across, which took a while. Anyway, I’m not sure how you’d easily get on to it if riding through the intersection itself, from memory the curbs on the upper queen street bridge are rather imposing…Will check that out next time. At the crossings themselves would be the place if coming off the road. Mixed with peds of course. In that scenario better to use the old shared path then cross further down…. nah would then need to cross at light controlled intersection anyway and backtrack. Completely off topic, but yesterday I travelled on the southern line. I don’t often use trains on the weekends due to the limited number of options around Takapuna. I was amazed to find that with a very reduced frequency there were no stops trains operating. Can someone explain why AT would make a patchy service even more patchy, or am I seeing this completely wrong? Yes when weekend daytime frequency increased from 30 to 20 mins they probably reasoned they could make the Onehunga line consistent on the weekend as per weekday (ie not stopping at Greenlane or Remuera). Once 30 mins times kick in it stops at these stations again. If pedestrians are using it then they need to have more clear signage saying that it is for cyclists only. At the very least pedestrians are going to get abuse yelled at them (probably rightly so as they shouldn’t be using it), and at worst there’ll be a collision where it’s likely the cyclist will come off worse off. I think in quiet times of the day it won’t really matter? Busy times they will feel the pain of dodging many cyclists coming towards and behind them & soon learn to use the other side. This is a great addition/upgrade to our reasonably quietly slowly growing cycle network. I think the little things (though this not really a little project) like the fairly recently done direct light crossing from the Grafton Gully Cycleway to the Lightpath Cycleway make so much difference to the user experience & so will likely mean increased usage by them & pickup by the people they are likely to recommend it to. Same with public transport “little things”. “Sweat the small stuff” as Bike Auckland once put it. I just used this new section yesterday. Really great addition to the network. So much better than previous. I can understand the comments around the Dominion road connection from the perspective of a commuter cyclist heading down Dominion. From a Safe System/Vision Zero perspective we should avoid high speed interactions between vulnerable people. People WILL make mistakes, so we don’t want the mistakes to happen at high speed and cause serious injuries or death. I can just imagine two e-bikes colliding at speed. A simple fall from a bike can be fatal.